Niklas Tyllström is at Hubbub 07 to talk about Green hat people, a pretty cool real life game where you get instructions in your cellphone and then go places in your city to find clues and answer questions. – We were lacking unpredictability in our lives. We came up with a concept where the real world is the playground. They found that people were not willing to pay for the service. Instead they are running an advertisement-based service. They had to move from everyone as a target to corporate events. – Just to stay alive, Niklas Tyllström says with a laugh. He still hopes that everyone will want to build their own games and play, though. 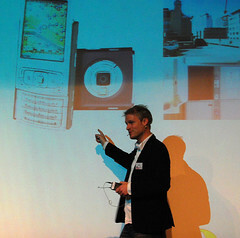 Once more the N95 is used as an example. They were asked to be part of the launch in Sweden. More powerful phones of course create greater gaming possibilities. – In our perspective, to make a multi-faceted game, it gets really cool. The gaming experience gets really intense. To make that happen on the mass market, that is a challenge. Marketing, partnering with organizations and going to schools are ways that Green hat people are working to broaden their user base. Timing is crucial for your concept to take off. – As being Swedish, and in that sense trying to promote a service that is derived from converging technologies, the drivers should really be highlighted. The pricing is important, and the ease of use. If you have to download something to use a service, there’s a good chance you don’t. Tyllström sees an age difference in that behaviour. Young people usually don’t see downloads as a problem. My photos from Hubbub end up here. And here’s the Hubbub Flickr photo pool where everyone’s sending photos. Social media is supposed to make it easier for everyone to contribute and to express oneself. But a lot of people are still shut out. 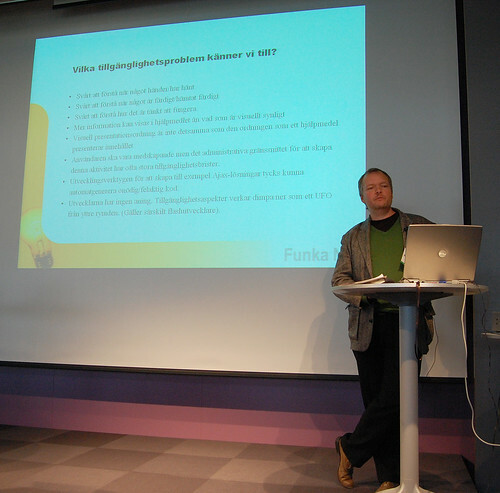 – Blog services are not accessible for everyone, says Stefan Johansson of Funka Nu. He talks about accessibility at the Morgondagens webbplatser conference in Kista outside Stockholm. 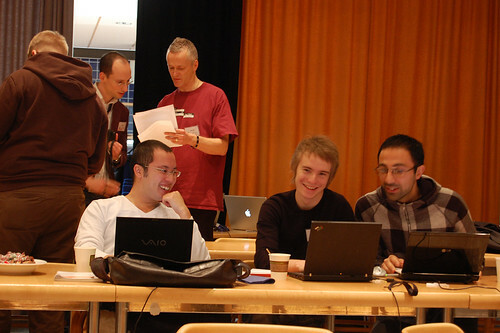 He gives the example of Blindbloggen, a blog started by blind people. In the beginning they were enthusiastic, but the project died out because it was too complicated to use the blogging tool. Accessibility issues are not only about people with physical disabilities. A lot of people simply don’t understand what they’re reading. It is a common problem that hasn’t yet been given much focus. – One fourth of all adults cannot answer control questions correctly about an article they have read in an ordinary morning newspaper. 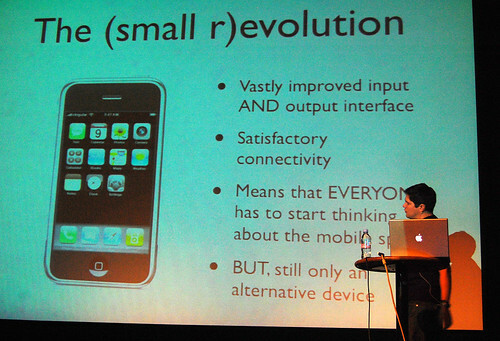 He thinks that accessibility is often forgotten when a new site or new functionality is developed. 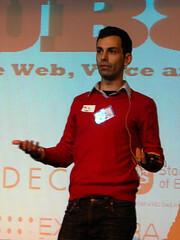 – Few site developers have problems with using a mouse, for instance, Johansson says. – They don’t think about it being a problem for some people. If you’re aware of the problem you can find a solution. Flash developers are also seldom aware of accessibility problems. As soon as you build in requirements in your web site, you shut out people. So how well does your site work with keyboard only? – The best people to test-run your site is one blind person and one with ADHD. People with ADHD have low patience, and need things to work right away. They will tell you what you need to change. 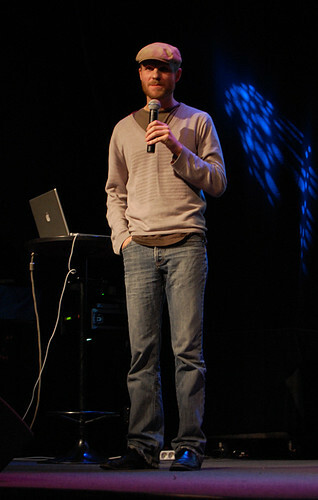 John Hargelid, producer at EA Digital Illusions, talks at Daytona Sessions about ads and the social aspects of gaming. They are connecting their games with websites. He mentions the game Skate. 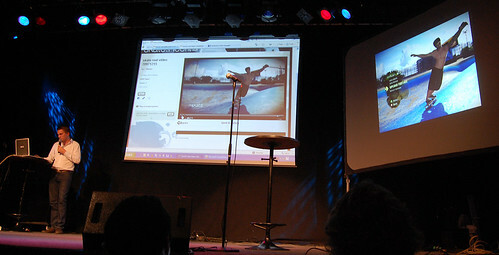 It has a video editing function, so that you can record your skate tricks, and upload them to a site. There you can share the clips with friends, on facebook, del.icio.us etc. They have ads in their games, a sponsorship deal with Intel, for instance. The target audience is well defined. 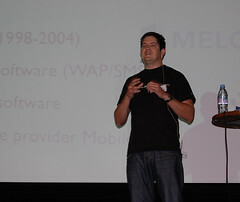 – In Asia games are often ad-financed, the user getting the games for free, Hargelid says. Qualitative analytics of blogs is Mattias Östmar‘s focus in his startup PRfect analys, which he presented at Daytona Sessions. – I like methods of measurement, and I like to define things, he says with a smile. – Marketing used to be about mass communication. It won’t die out, but targeted marketing will compete with it. It is harder today to reach out to an audience. You have to be better and more funny. Reach as the only measurement of success will not work. Media becomes a number of conversations. Getting a full coverage of media will be close to impossible when everyone becomes a publisher. The concept of journalism will be more vague. When form is separated from content, the channel is never as important as the person behind the message, Mattias says. Who you listen to is a person like yourself. Personality type testing is important, because you need to know what drives people. What ticks them off. There are different type theories. Östmar shows Keirsey’s types. Your choice of words communicate your personality. Analysing the words in blog posts will tell what personality the blog has. It becomes much harder when you bring in context as a parameter. He asks for a bit of help with the business model. – I’ll buy you a beer! …though the main theory is that if you can predict people’s needs, you can reach them more effectively. That should indeed be interesting to marketers and communicators.